SERRA is strongly opposed to yet another tall tower infill project in the Davisville apartment neighbourhood. Please come out to the meeting and make your opposition known! There is even some original city council documentation, specifically stating that this location is to remain as an open area! The following notice has been provided by The City of Toronto Planning Group. 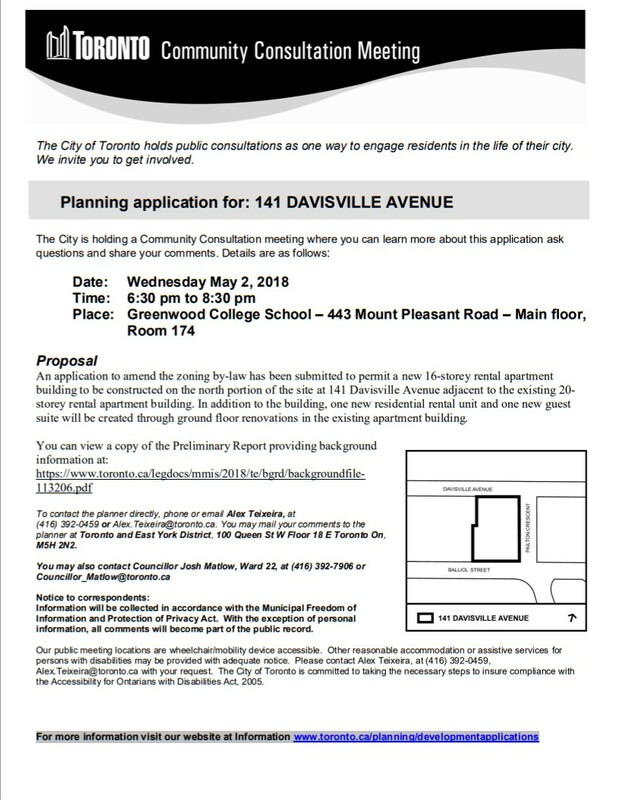 An application to amend the zoning by-law has been submitted to permit a new 16-storey rental apartment building to be constructed on the north portion of the site at 141 Davisville Avenue adjacent to the existing 20-storey rental apartment building. In addition to the building, one new residential rental unit and one new guest suite will be created through ground floor renovations in the existing apartment building. To contact the planner directly, phone or email Alex Teixeira, at (416) 392-0459 or Alex.Teixeira@toronto.ca . You may mail your comments to the planner at Toronto and East York District, 100 Queen St W Floor 18 E Toronto On, M5H 2N2.